Many thanks for your kind comment, Andrew. Much appreciated. Thanks a lot, Delores. Isn't that a fantastic work of nature? The little boy whom I did not know seemed to be mesmerized by it... didn't seem to know I was there. This is so cool! Beautiful composition and gorgeous colors. Thank you for your gracious response, Elena. Much appreciated. Many thanks for your gracious response, Brenda. Thank you very much for your gracious response, Gardening Perfection. Many thanks for your gracious response, John. Much appreciated. Thank you very much for your thoughtful comment, Patti. Thanks, Tim. 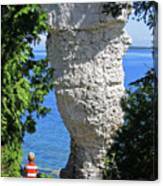 Flowerpot Island is well worth seeing. The formations are amazing, as you can see here. Thank you very much, Sherri. This little guy was so intent on what he was seeing that he had no idea that anyone else was around. Shawn, many thanks for featuring Awesome All Around in the Wonders of Nature Photography group. Robert, thank you for featuring Awesome All Around in the Nature Photography group. Merridy, many thanks for featuring Awesome All Around in the Rocks group. Thank you very much for your kind comment, Cindy. Many thanks. The little boy was standing on the path in front of me, taking in the scene as was I. So what could I do but include him in my photo? Very impressive picture Ann - Chris. 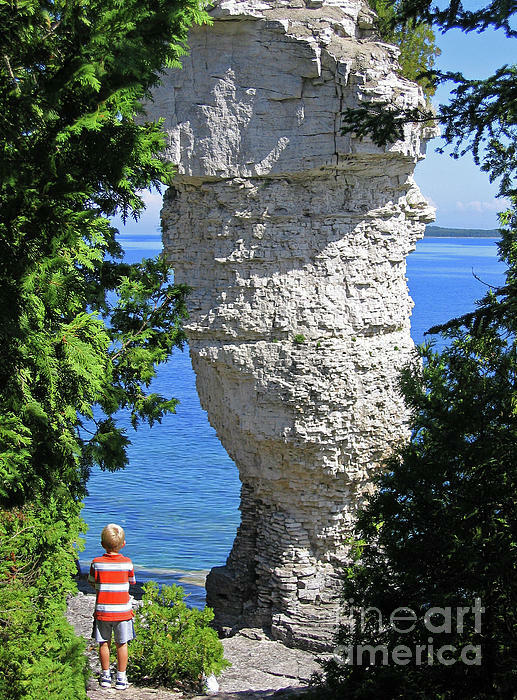 Standing by a massive monolithic limestone sea stack on Flowerpot Island, a young boy on summer vacation looks out at the blue waters of Georgian Bay, a large arm of Lake Huron, one of the Great Lakes. 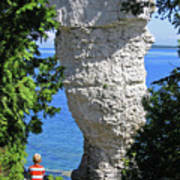 Flowerpot Island is part of Canada's Fathom Five National Marine Park and is accessible from Tobermory, Ontario, Canada. Copyright 2005 Ann Horn. ALL RIGHTS RESERVED. This copyrighted image does not belong to the public domain and may not be reproduced, copied, altered or manipulated in any way without the written permission of Ann Horn. ann-horn.pixels.com. pixels.com Group Features: Wonders of Nature. Nature Photography. Rocks.